Posted on January 8, 2018 at 4:35 pm. The UK Gambling Commission could revoke more than five online casino licenses due to alleged anti-money laundering breaches. While it’s a new year, the UK regulatory crackdown on online gambling operators continues, and the responsible gaming regulator wants all of its licensees to be on top of their security provisions. The UKGC released a statement on its website, revealing it is investigating 17 operators regarding their controls to prevent money laundering, terrorist funding and problem gambling. The regulator said it was already considering a license review of five of the 17 operators following early investigations into whether they were doing enough to block criminals from using their sites as a way to launder money. Online gambling sites in the UK that lose their license will no longer be able to operate in the market, which is considered to be one of the biggest in the world. The UKGC sent out a letter to its firms warning that it had found some of its licensed operators had hired reporting officers without qualifications who were “unable to provide suitable explanations as to what constitutes money laundering”. It also said online operators needed to be extra vigilant in submitting information to the National Crime Agency, as well as other law enforcement organisations. “It is vital that the gambling industry takes its duty to protect consumers and keep crime out of gambling seriously,” UKGC Chief Executive, Sarah Harrison, said. The UKGC has increased its regulatory efforts surrounding the government’s triennial review of the gambling industry. While the government is focusing on betting shops and fixed odds betting terminals, the media is spreading its headlines between the offline and online gambling industries. As a result, the UKGC has set out a new strategy to make gambling fairer and safer for its online players. 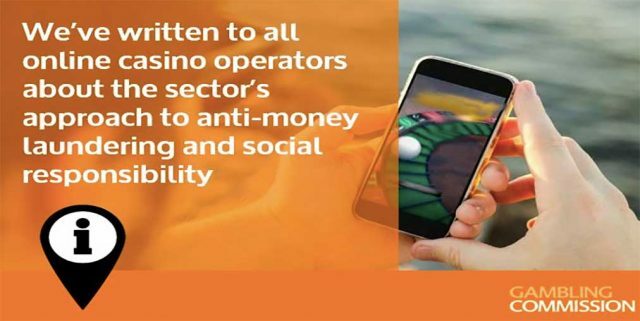 “The action we are taking to examine online casino operators’ compliance with money laundering and customer interaction requirements is just one example of how we will be relentless in turning that vision into reality,” Ms Harrison said. Reducing problem gambling rates has also been at the forefront if the gambling regulator’s agenda. Last month, UK media outlet BBC sent its reporter undercover to 21 betting shops, where he used the problem gambling control system to self-exclude from each venue. Although they all received a photo, along with his name, he was able to play at 16 before staff asked him to leave. The UKGC said it would be looking into the system following the investigation and has also turned its attention to online problem gambling controls. The regulator said some online operators failed to intervene when customers displayed signs of problem gambling, and that the “behaviour did not trigger a customer interaction”. While it’s not clear which UK online casinos are under review, given the magnifying glass, all 195 licensed operators will likely improve or update their controls and policies. Looking for a licensed online casino? Players from United States should check out our favourite site Bovada Casino to spin the reels or play a hand or two of blackjack. The site is secure and popular with players worldwide, so you can make a deposit without worrying someone else will steal your financial information and enjoy gaming in peace.